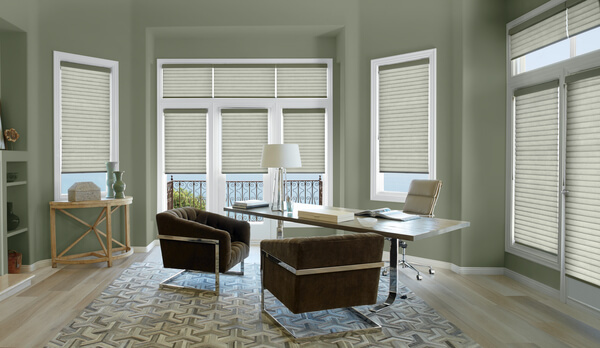 In this article, A Shade Above – with conveniently located showrooms in Charlotte and Cornelius, North Carolina (NC) and North Myrtle Beach, South Carolina (SC) – is here to help you learn about the many benefits of Sonnette™ Cellular Roller Shades from Hunter Douglas. Contact us today to learn about the beautiful Hunter Douglas window treatments we offer. With fall fully in swing and winter moving ever closer, now is a great time to think about ways you can lower your energy consumption and keep your home more comfortable during the cooler months. Hunter Douglas offers many energy-efficient window treatments that can do just that, including the beautiful Sonnette™ Cellular Roller Shades. At A Shade Above, we offer a multitude of options to customize Sonnette™ shades and make them perfect for your home. Stop by one of our four convenient showrooms today and let our friendly professionals show you the many benefits of these amazing shades. Sonnette™ Cellular Roller Shades combine the energy-efficient construction of a honeycomb shade with the simple design offered by roller shades. These beautiful window treatments trap air in their pockets to keep it from escaping through your windows. Since you can lose up to 50% of your heating and cooling energy through your windows, Sonnette™ shades can help keep your home more comfortable and allow you to cut your reliance on your heating and cooling units, saving you money. Sonnette™ shades are also a safer option for homes with children and pets. They feature a cordless design which removes strangling hazards. Additionally, they are available with the SoftTouch™ Motorization System, which is a battery-operated system that is controlled with a simple wand. You can also choose the PowerView® Motorization operating system, which allows you to control your shades with a remote or your smartphone or tablet. While functional benefits are important, you shouldn’t have to sacrifice style to get the ones you need. Luckily, Sonnette™ Cellular Roller Shades are available in 48 beautiful colors, so you can create exactly the look you want in your home. The selections include both neutrals and vibrant colors, which makes it easy to create focal points in your room or give your home a more polished appearance. Each fabric also has different opacities available, allowing you to always get the perfect levels of light control and privacy. If you’re interested in learning more about Sonnette™ Cellular Roller Shades or any of the other incredible Hunter Douglas window treatments we offer, contact the experts at A Shade Above today! We have several showrooms where you can see and interact with full-sized displays of our products, and we offer in-home consultations to help decide which product is best for your specific needs. Our showrooms are located in Charlotte and Cornelius, North Carolina and North Myrtle Beach, South Carolina, and we proudly serve the greater Charlotte, NC area and beyond.